· Reserved with plenty of space to fit your FPV and tuck away all the wires. · Full carbon fiber material makes the whole frame ultralight with firm structure. 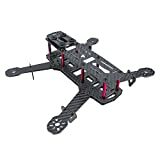 · Eight copper standoffs to assemble the frame, providing a stable flight for your quadcopter. · Compact design with few components, easy to build.